This contemporary sectional sofa group with a lounge provides a great place to gather with family and friends. Track arms provide comfort and style with three soft pillows. Welt cord details add sophistication to the sectional. It makes a great addition for socializing in a living room or watching movies in a family room. 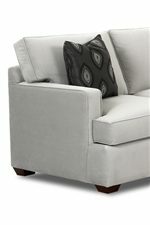 Use the chaise end to curl up and snuggle into the plush cushions. Tapered block feet and three soft pillows add the perfect amount of comfort to this sleek and modern sectional. The Lewiston 3-Piece Sectional by Metropia at Ruby Gordon Home in the Rochester, Henrietta, Greece, Monroe County, New York area. Product availability may vary. Contact us for the most current availability on this product. Tailoring Clean tailoring with welt cords. Arm Slim straight contemporary track arm. Leg or Skirt Smooth covered base with subtle feet. Metro, urban appeal and feel enhance your home with the Loomis collection. The sectional's sharp look features a clean style with welted track arms that offer a contemporary look. Further complementing the comfortable sectional's style are bordered, welted, t-style cushions. Finished wood block legs and accent pillows complete the impressive Loomis collection. Many fabrics available by special order allow you to create your perfect sectional group. The Lewiston collection is a great option if you are looking for Contemporary furniture in the Rochester, Henrietta, Greece, Monroe County, New York area.